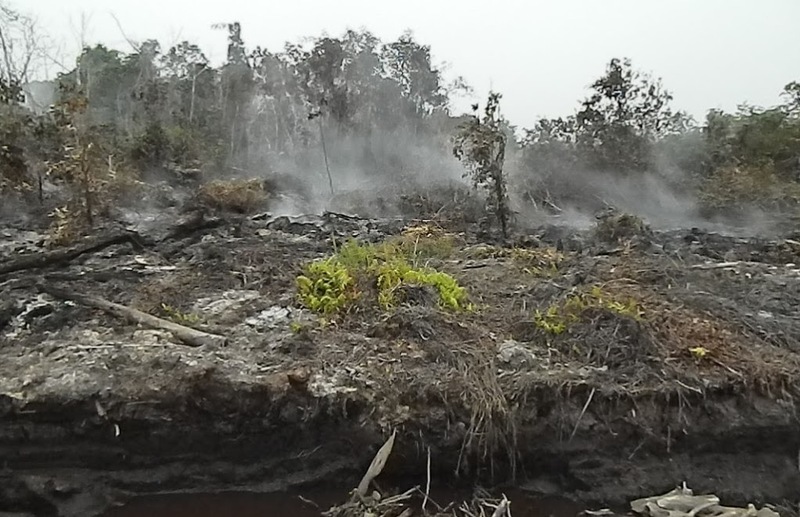 ‘Maybe that’s why there’s so many fires’: Was a peat swamp illegitimately stripped of protected status in Indonesia? An oil palm company’s concession in Central Kalimantan is said to lie on a stretch of deep peat that was removed from Indonesia’s forestry moratorium based on an erroneous government survey. The concession is now full of fires, fueling the haze crisis that is contaminating the air in Indonesia, Malaysia and Singapore. A presidential unit on development oversight was investigating the concession last year until it was disbanded by the new president in December. A massive peat dome on Borneo’s southern coast is under threat from an oil palm firm whose area of operation should never have been removed from Indonesia’s moratorium on new licenses to clear primary forests and peatlands, according to individuals from the private, public and nonprofit sectors who have investigated the company’s concession. Land clearing has begun, threatening local orangutan populations and jeopardizing a nearby conservation project, sources say. Work on drainage canals started six months ago. The company, PT Persada Era Agro Kencana (PEAK), has planted its first oil palm seedlings. 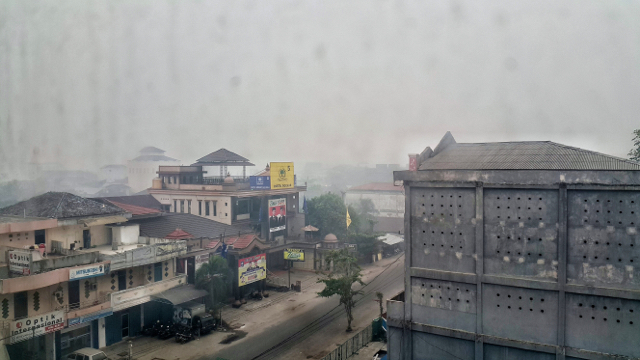 The concession is also full of fires, fueling a severe outbreak of smoky haze across the region which counts this province of Central Kalimantan as a critical epicenter. The concession was brought to Mongabay’s attention by Dharsono Hartono, CEO of PT Rimba Makmur Utama (RMU), which holds an ecosystem restoration license to manage around half of the peat dome, located between the Mentaya River to the west and the Katingan River to the east near the Java Sea. Dharsono said PEAK’s activities threaten the viability of RMU’s project, set up for the purpose of selling carbon credits for profit and tackling climate change in line with Indonesia’s REDD+ initiative. He explained that the draining of PEAK’s concession – peat is a carbon-rich, marshy material that must be drained before it can be planted with oil palm – will lower the water table in RMU’s zone and jeopardize the green investment project, which covers 108,255 hectares. “The impact of their land clearing will be very detrimental to us, because it’s one ecosystem,” Dharsono said. “If they open land in a massive way, it will interfere with what we’re doing. That potential has already become a reality, whether as a result of PEAK’s activities or not. Forty-nine hotspots are burning near the Katingan River where PEAK’s concession lies, according to Global Forest Watch Fires. Reza Lubis, an ecologist with Wetlands International who visited the area in early September, confirmed the presence of fires in the concession – and said PEAK was doing little to fight them. 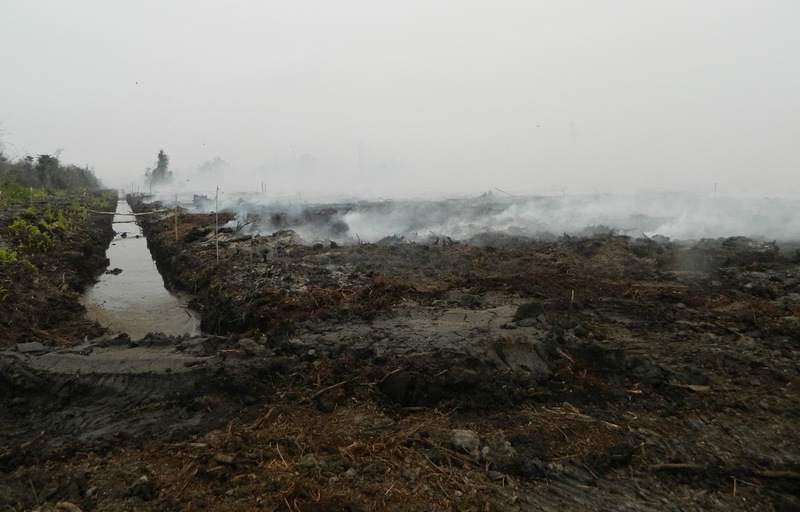 Fire is often used illegally as a tool to clear land cheaply for agriculture. The flames, Reza added, are spreading to forested areas and also toward the border with RMU. Reza and Dharsono both say PEAK’s area consists of peat, meaning it never should have been removed from the moratorium, established under an agreement with Norway in 2011. 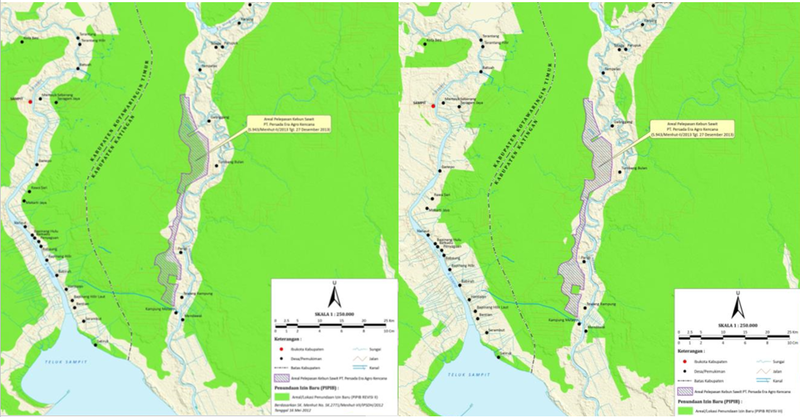 The moratorium map, revised every six months, was redrawn by the Forestry Ministry (since merged with the Environment Ministry) in 2013 to exclude the area covered by PEAK’s concession after the company applied for its removal on the grounds that it is not actually peat. In June last year, after Yayasan Puter Indonesia (YPI), an NGO focused on rural Kalimantan, reported it really does consist of peat, a now-defunct presidential unit on development oversight, known as the UKP4, wrote to the Forestry Ministry requesting an explanation for the decision, correspondences show. An image from Global Forest Watch Fires shows a cluster of 49 hotspots (upper-right of detail) just west of the Katingan River, right where PEAK has its concession. In August, the UKP4 conducted its own investigation, entering the field without the company’s knowledge to check the soil composition. The ground check revealed deep peat at several points. There were also orangutan nests, as well as large birds of prey, indicating a stable food web and healthy ecosystem. 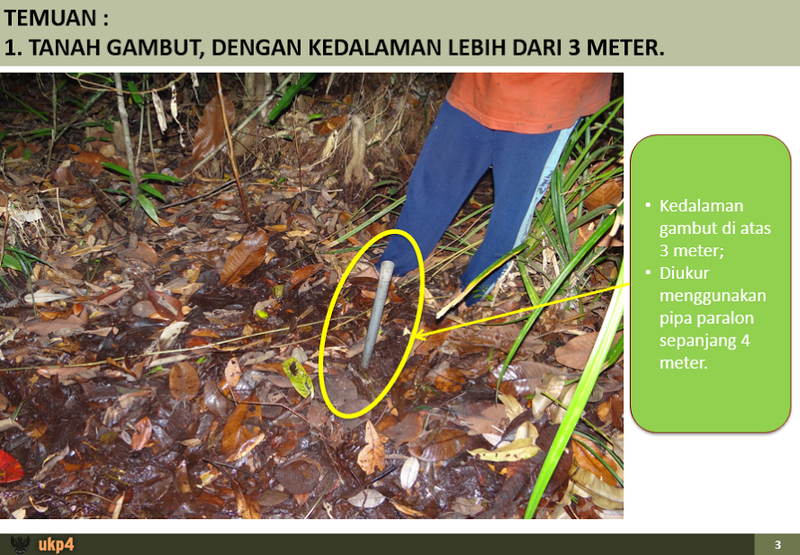 The UKP4 alerted the Forestry Ministry to its findings. But in December, the unit was disbanded by new President Joko “Jokowi” Widodo, who had taken office in October. The onus of the investigation passed to the National REDD+ Agency (BP REDD), but in February it too was disbanded, folded into the newly merged Environment and Forestry Ministry as Jokowi motioned to streamline government and reduce overlap. An image from the UKP4’s August 2014 ground check of PEAK’s concession. To determine the depth of what the report says is clearly peat, investigators stuck a four-meter-long pipe into the ground. It reached down almost to its length. An image from the UKP4’s August 2014 ground check of PEAK’s concession shows the sample points overlaid with the concession area. BB SDLP chief Dedi Nursyamsi did not respond to a request for comment. Neither did Andre, the man said to own PEAK. His phone was turned off when Mongabay called, and he did not reply to a text message. San Afri Awang, the Environment and Forestry Ministry’s new director-general of spatial planning, said he would follow up on the matter. 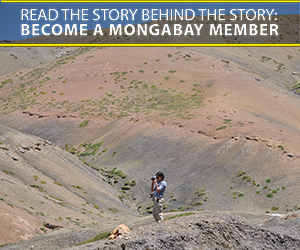 “This should be checked immediately,” he told Mongabay. Karya Darma, an official from the Katingan district government, said that as far as he knows everything with PEAK’s concession is in order. “To my knowledge, [the concession] is not on land covered by the moratorium,” he said. “We wouldn’t dare issue a license on peat,” he added. In Indonesia, district governments control key oil palm permits. If the area on which PEAK is operating truly does consist of peat, its removal would not be the first irregularity associated with Indonesia’s moratorium. According to NGOs, clearing in breach of it, mainly due to its lack of teeth, is widespread. YPI, the Kalimantan-focused NGO, originally flagged 12 peatlands as having been removed from the moratorium, not just the one. 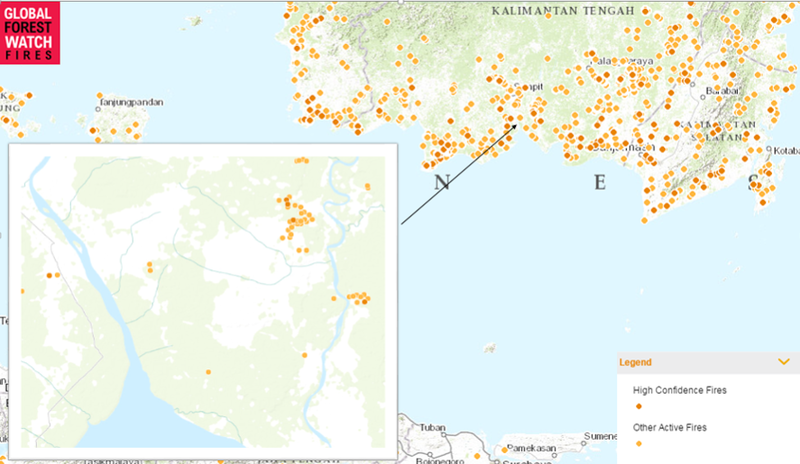 The sites are dispersed across Katingan, Kapuas, Pontianak and Ketapang districts in West and Central Kalimantan provinces. Nirarta Samadhi, former deputy head of the UKP4, said that when a company applies for an area to be removed from the moratorium because it is not peat or primary forest, it is up to the government to analyze the claim. The government is generally underresourced, and companies in this situation can work faster, he added. While cases like PEAK’s are “quite common,” Nirarta believes, the YPI report about it was one of only a few such complaints the UKP4 dealt with during his tenure. He attributed this to complaints not always going up to his unit but probably more often being handled by the Forestry Ministry or the Geospatial Information Agency (BIG). Iriana Jayasantika, a YPI staffer, said that after the NGO flagged the 12 sites, the Forestry Ministry asnwered that in most of them, concessions had been issued before the moratorium took effect in 2011. Backdating of permits issued after the moratorium’s start date is not uncommon, said Yuyun Indradi, forest campaigner at Greenpeace Indonesia. 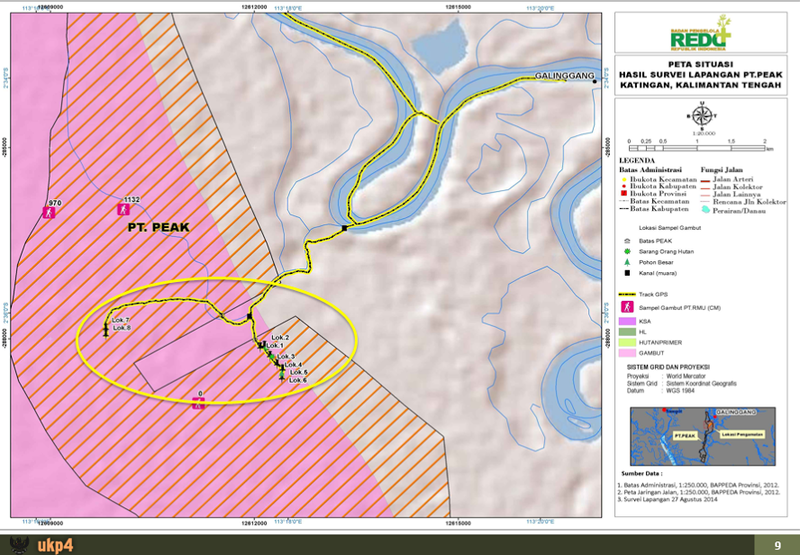 The current problem, Yuyun added, is that the Environment and Forestry Ministry is less transparent with moratorium data than were the UKP4 and BP REDD, which would post the maps online so NGOs could download them. Iriana doesn’t think PEAK’s area is the only peatland to be illegitimately removed from the moratorium. “The problem is systemic,” he said. “They revise the moratorium map every six months, but it never really grows – it just keeps shrinking. “Maybe that’s why there’s so many fires,” he added with a chuckle. 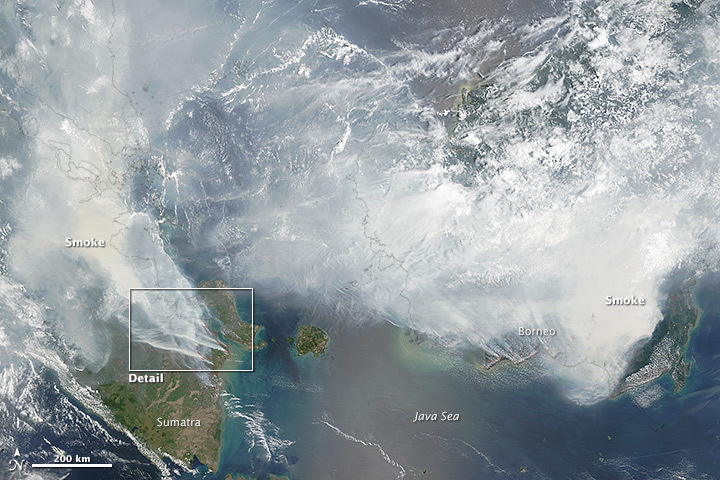 A satellite image released this week by NASA captures plumes of smoke emerging from fires burning in Sumatra and Indonesian Borneo.